The hunt for a possible site for constructing an artificial lake here is on. At least two new sites along Ghaggar river have been identified for the purpose. After years of deliberation upon the issue of introduction of a masters degree in fine arts (MFA) at the local Government College of Art, Sector 10, some hope has been forthcoming this year. Taking care of students’ grievances, the UT Consumer Disputes Redressal Forum-II has directed St. Peter’s Secondary School, Sector 37-B, through its Principal to refund the caution money amounting to Rs 5000 to its students. The local Municipal Council is likely to clear a proposal tomorrow to bring Balongi and Badmajra villages within its jurisdiction. For Manpreet, a 24-year-old residing in the city, life is as bad as it can possibly get. Into drugs now for eight years, Manpreet is now jobless, divorced, heartbroken and in extreme physical distress. 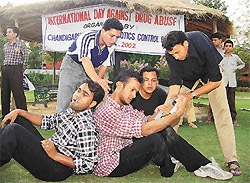 Artistes from the Sakaar Manch perform a play “Shok se aadat bani” on the occasion of International Day Against Drug Abuse at police lines, Sector 26, Chandigarh, on Wednesday. Brazil fever is running high in the city. This could be gauged from the fact that on Wednesday, Brazil was the favourite with soccer fans in the city, which comprise schoolchildren and other die-hard soccer fans. 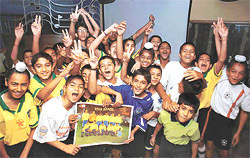 REACHING A CRESCENDO: Soccer players of St. Stephens Football Academy in a jubilant mood after Brazil’s victory over Turkey, at Classic Hotel in Chandigarh on Wednesday. Foreign direct investment (FDI) may be the mantra for growth in Industrial circles. But the announcement made by the Government of India to open up the newspaper industry for 26 per cent FDI has evoked sharp reaction, or rather, criticism from intellectuals and former senior journalists based in the city. A local industrial unit owner has been robbed of about Rs 1.83 lakh in cash and his brand new car by men posing as railway officials who had come to strike a business deal with him. Citizens Awareness Group in collaboration with the Chandigarh Social Advisory Board organised an awareness generation programme for rural and poor women in Government Model High School, Badheri (U.T.). About 40 women participated in the programme. Erratic power supply and drastic voltage fluctuations in the township are causing a lot of hea(r)t burn among the residents. With Uttar Haryana Bijli Vitran Nigam (UHBVN) failing to meet the total demand of 70 MVA here, the problem is likely to increase as the paddy season progresses. A team of food inspectors from the UT Health Department conducted a raid at a residence complex in Dadu Majra colony and took samples of a local resident manufacturing and packing namkeen from his residence. The CIA staff, Ropar, has arrested Devinder Singh, alias Binder, today following the recovery of ½ kg opium from his possession. The police has busted an inter-state gang of poppy husk smugglers with the arrest of four persons. In order to show resentment against the Punjab Government and the bank management, members of Punjab State Cooperative Bank Employees Union (PSCBEU) held a gate rally during lunch hour yesterday. Crescent Systems, a multi-disciplinary training organisation, has launched a host of training programmes under the banner of Global Voice for meeting the needs of different segments. Realising the “futility” of doing “plain-simple graduation”, a large number of city students interested in humanities, after passing their class X examinations, are rushing to take admission in government schools offering vocational courses like Fashion Designing and Information Technology. A directive issued by the All-India Council of Technical Education (AICTE) regarding seats reserved for non-resident Indian (NRI) students in private engineering colleges has come as a blow to institutions in Haryana. Panjab University has postponed the entrance examination for admission to MA I (English) scheduled for July 2, said an official press note here today. Panjab University will declare results of certain semesters of engineering courses tomorrow. Continuing with their battle against alleged corruption in the judicial system, an eight-member delegation of the Punjab and Haryana High Court Bar Association met the Union Minister of Law, Justice and Company Affairs, Mr Arun Jaitley, in New Delhi today. The president of the Panjab University Students Union (PUSU), Malwinder Singh Kang, who has been arrested by the UT police in connection with an attempt to murder case, was granted bail on furnishing bail bond of Rs 15, 000 by the UT Additional and Sessions Judge, Ms Sneh Prasher, today. Visitors to the Lake Club were today treated to a musical evening with a difference. Way apart from a routine show, this evening of ghazals organised by Udaan...beyond the horizon, was all about promotion of local talent. Watching children as young as five years of age chant shlokas in the purest Sanskrit was a sheer matter of delight this evening. . As bharatanatyam danseuse Suchitra Mitra conducted the grand finale of the month-long workshop in the dance form which she conducted at IMA Bhawan, Sector 35, nuances of the art form unfolded before the audience. A fine coaching by former national boxer Varinder Dangi, enabled the Chandigarh team to bag six medals in the just concluded Northern India Senior Men and Women Boxing Championships held at Kanpur. The Municipal Council has rejected the designs submitted by architects for constructing its new building in Sector 68 here.